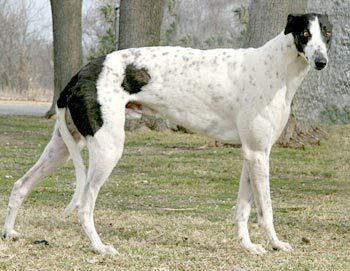 Prince, aka Flortex Prince, is a 1½-year-old white and black male born April 15, 2007. His sire is Kiowa Sweet Trey and his dam is Jimbo Tisha. Prince suffered a minor injury during schooling and it was decided that he should move on to retirement. He is a big, sweet boy who is ready to enjoy many fun-filled days ahead. Prince is a prince with cats: Prince passed the cat test. He was interested in sniffing and checking them out, but turned away on his own or if batted by a feline paw. 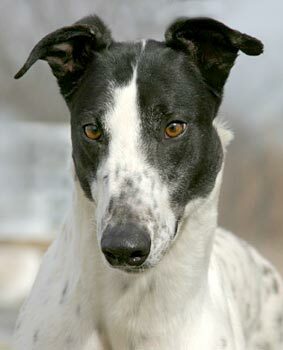 Of course, we advocate close supervision upon introducing a new Greyhound to a home with cats. 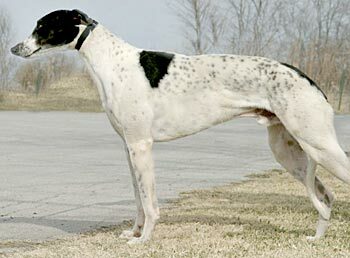 Prince is a big, beefy Greyhound with the neck of a linebacker! He’s a rather gentle, mildly timid guy, though. He’s not jumpy or spooky shy; he’s just getting used to a non-track environment, which is a whole new world. He seems to find security with a human companion and stays very close. He walks greyt on a leash as a result, but sometimes needs a gentle push to get his hindquarters the rest of the way through a doorway. It should be interesting to watch his personality blossom once he gets in a foster home and onward to his forever home.